It’s the morning after opening ceremonies for the 2016 Rio Olympic Games dazzled thousands of fans inside Maracanã Stadium and millions more around the world with a stunning celebration of both Brazil and the Olympic spirit, and The Coca-Cola Company’s social media newsroom is abuzz with both pride and purpose. A team of marketers from the company’s Brazil and Atlanta offices keeps an eye on a wall of monitors, some of which are broadcasting the day’s competition while others track social media posts about the Olympic Games and Coca-Cola. Several team members peck away at laptops, and others huddle around tables, scribbling ideas in Portuguese. Their job? To find ways to tastefully tap into trending conversation with timely and relevant Coca-Cola content every day during the Games. The space is tucked inside Parada Coca-Cola – a happening hotspot for teens in a converted warehouse in downtown Rio's hip in hip Praça Mauá district. A similar hub in São Paulo is focused on POWERADE content. The full operation is powered by a total team of 100 social media analysts, strategists and creatives. Coca-Cola Brazil piloted the real-time newsroom concept during the 2014 FIFA World Cup, establishing a consumer engagement model focused on four pillars: Listening, Engaging, Reacting and Amplifying. 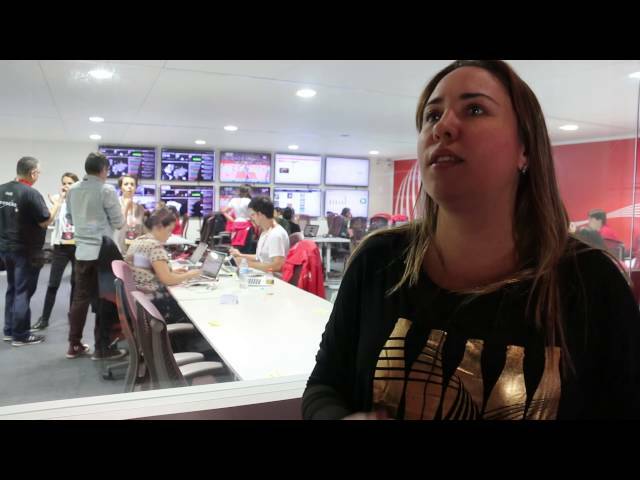 Coca-Cola Brazil&apos;s real-time newsroom during the 2014 FIFA World Cup. Each morning at 10 a.m., the team huddles to discuss hits, misses and learnings from the day before. They also review trending topics and map out a plan and responsibilities for the next 24 hours. Social content coming out of the Rio newsroom is meant to complement the company’s global #ThatsGold campaign – which includes TV commercials, outdoor ads and more – and links its messaging to in-the-moment conversation. Parada Coca-Cola in downtown Rio de Janeiro. “Real-time marketing is all about leveraging the context – understanding what people are talking about and what’s important in their lives right now, and connecting our campaign with this context,” Knackfuss. And the team won’t have to go too far to find inspiration. Parada Coca-Cola will welcome an estimated 150,000 teens during the Games for concerts, celebrity and athlete appearances, and an interactive #ThatsGold experience. Take a look at the real-time marketing inside our UEFA EURO 2016 war room.